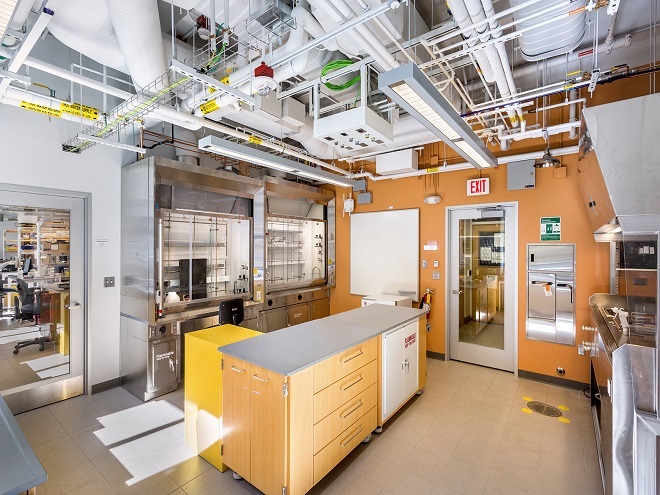 The Cohen Lab project consisted of the renovation of the existing Cohen Laboratories and support spaces located on the first floor of the Edward Mallinckrodt Chemical Laboratory. The scope of work includes the total renovation of the first floor laboratories, including a new instrumentation facility, tissue culture room, biology lab, chemistry lab, optics labs and the renovation of the existing student write up spaces. Miscellaneous areas on the ground and basement levels are also included as part of this renovations in support of the main renovation on the first floor. The project’s goals were to create high performance lab spaces that optimize the indoor environment, reduce resource consumption, and reduce the overall impact on the environment.